If you’re struggling with finding traffic, this article can be a lifesaver. As you’re about to see, I was able to generate 10,000 Facebook fans with a measly $50 ($52.06 to be exact) spent on Facebook ads. This was all achieved in just 1 week! Once you have a sizeable fan base, you will have a targeted audience to communicate to on Facebook. Of course, you can then easily send your fans over to your website and offer them your products and services. I’m going to show you the process that I implemented step-by-step to accomplish this. Facebook is the new Google. Today, it’s not easy to quickly drive traffic using SEO to a brand new website. 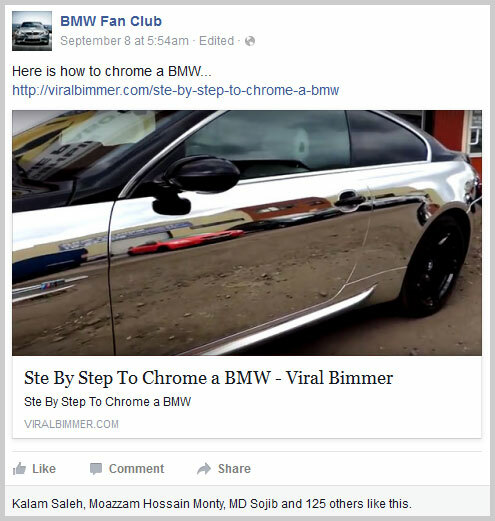 Smart marketers now turn to Facebook as their primary source of traffic. But there is 1 problem. Most people don’t know how to acquire traffic using Facebook’s advertising platform both cheaply and fast. 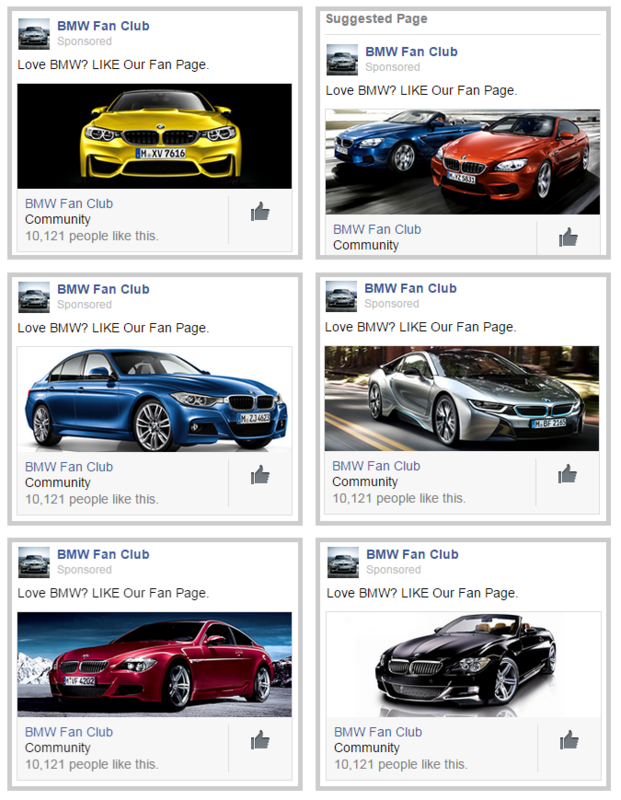 In this experiment, I rolled up my sleeves and got to work on setting up a brand new BMW fan page and show you how I acquired a huge fan base for it. I got about 1000+ free page likes when people shared some of my posts. That’s a bonus to me. So, it’s a total of 10,121 page likes. Here is a post with 6,839 people reached. And a total of 725 likes, comments and shares. Here is another post: 3,595 people reached. And a total of 389 likes, comments, and shares. As you can see, you CAN succeed in driving traffic from Facebook quickly and at a very low cost. Even if your site is only a few days old! Now that you have seen my results, it’s time for me to walk you through the step-by-step process that I used. My first step was to set up a Facebook fan page for my niche. 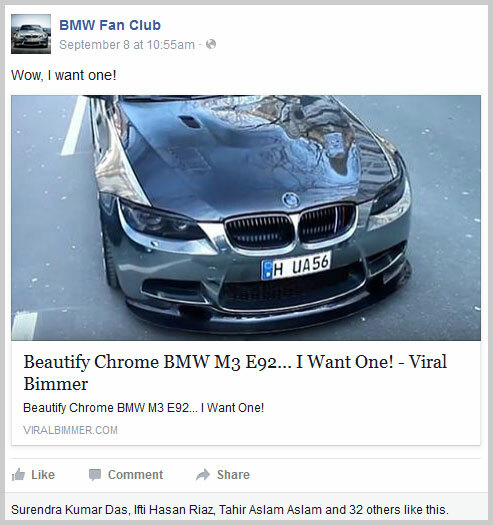 I just started a new viral video site on BMW cars then, so I needed a fan page for it. 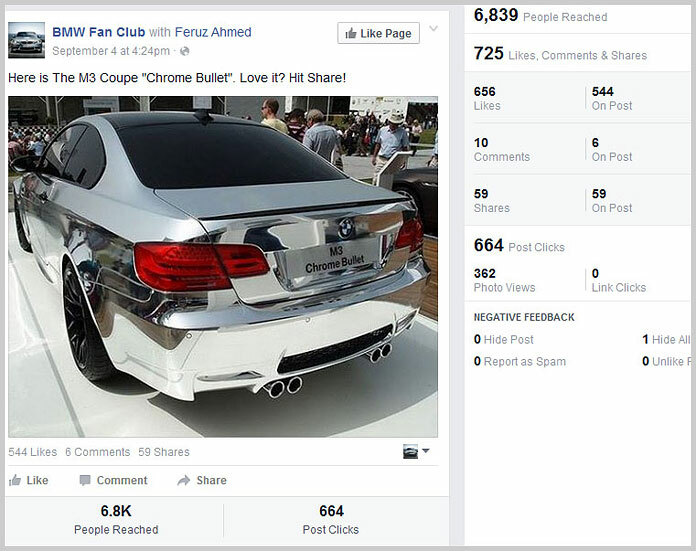 It’s totally free and easy to set up a Facebook fan page. I created my page in less than 5 minutes. Next, it was time to actually publish content on my page. I collected a couple of images to upload to my BMW fan page. I wanted to do it so that my page won’t look “blank”. These were just some fillers to complete my fan page before I sent traffic to it. I hopped over to Pinterest. I punched in the key phrase “BMW cars” into the Pinterest search box to find the images that I wanted. I went through the search result images and selected a couple of images that I liked. It was nothing big what I picked at that point. I just wanted some images to post on my fan page so that it won’t look blank to its visitors. Once I had my fan page ready to rock, I got down to business buying some traffic to it. When people publish a few posts on their fan page, most of them just cross their fingers and HOPE that their posts get viral. They understand that any fan page needs promotion, but they’re afraid to go out and pay for traffic. Because they’re unsure of the price they’re going to be charged for their ads. The first step in paying for Facebook ads is to find ad inventory that FB has with very little competition. This is why I always go for countries with tons of ad inventory nobody wants to bid for, just sitting there for anyone to take. Unless my niche forces me to advertise only to US audiences (example: US veteran), I rarely start any ad campaign targeting the US. …Until I’ve had my pie on the rest of the English-speaking audiences in other countries. Most marketers target their ads at US audiences only. Their theory is this: the US population is the most profitable to monetize with. People in the US are constantly bombarded with ads on their Facebook newsfeeds almost every day. They’re less responsive to ads compared to FB users in a developing country who rarely see any ad pop up on their newsfeeds. I get good CTR on my ads when I run them overseas. That’s reason No. 1 why I run ads overseas – I get high ad click through rates. Reason No. 2 why I’m not running ads to US audiences is this: it’s expensive. 99% of advertisers compete for the same ad inventory in the US. So the ad prices are expensive in most of the niches that you can think of. There are so many English-speaking populations outside the US and Canada. The UK, Australia, New Zealand are the obvious alternatives. Well, we have the Commonwealth countries – 53 member states that were mostly territories of the former British Empire. They have an estimated combined population of 2.328 billion at present, nearly a third of the world population. Most of the population read and speak English. India is one of the former Commonwealth countries. The number of Indians who speak English is almost half the US population! Apart from Commonwealth countries, there are millions of people in Western Europe and in Asia who read and speak English almost every day. Traffic from overseas are not monetizable? I’m from Malaysia; it’s one of the developing countries in South East Asia. People here buy regularly from Amazon and eBay and we see AdSense ads pop up on websites just like what the rest of the world sees. Amazon international sales accounting for nearly 40 percent of the company’s total sales. There is a huge, huge population out there we can run ads to. 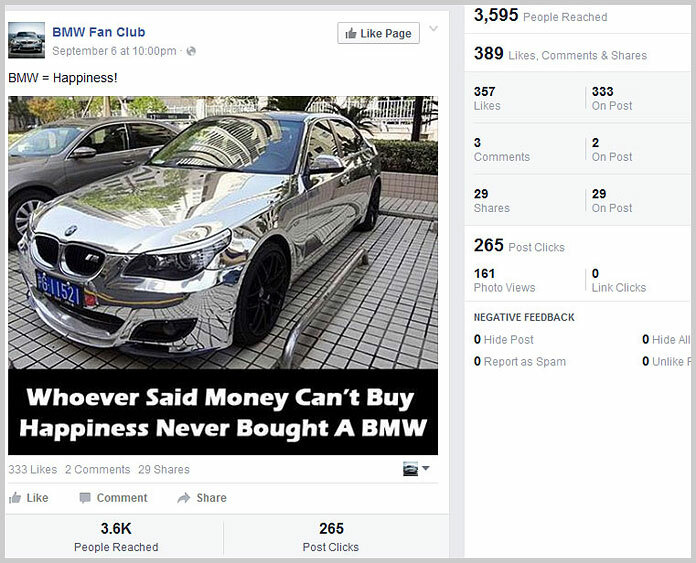 Not only are these people cheaper to reach, they’re also more responsive to ads on their Facebook newsfeeds. First, I created a new Page Like campaign. Then I created my ad sets. I created 7 ad sets, setting up each one with $1 daily budget. That means I wanted to spend $1 per day for each of my ad sets. Since I had 7 ad sets, the maximum I’d spend was $7 per day. Next, I set up the target countries, interests, age group and language. The countries were mostly developing ones each with a significant population who speak English. Most advertisers don’t run ads to these countries. There’s a huge inventory of ads sitting out there, ready to be sold to me at dirt cheap pricing. I run my ads on mobile newsfeed only. Which means that my ads will show up on people’s FB newsfeeds only when they’re on mobile devices. As you can see, my ad copy is short and to the point. I asked a question and get my target audience to like my fan page. Since I ran 7 ad sets at the same time, I went ahead and added 6 more ads. I wanted to test which ad performed better. I let them all run for 24 hours, then I kept my winners and dropped the losers. That let me saved some money by optimizing my campaign. Side Note: Depending on the daily budget you’re willing to spend, you can start with less or more ads. There is nothing set on stone here. 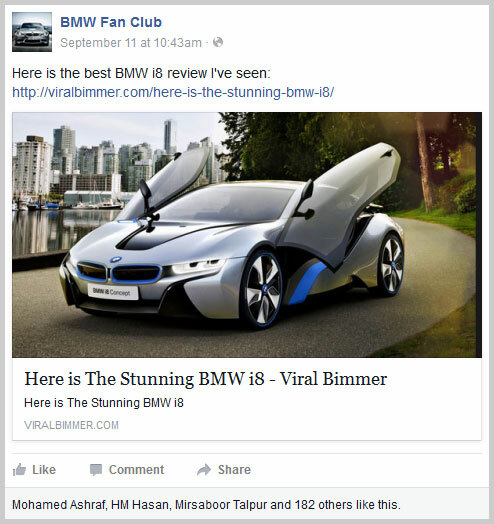 I started out with 7 as I wanted to test different BMW models, angles and body colors to quickly find my winners. At this point, I had my campaign ready to be launched. I submitted the campaign to Facebook and my ads all went live within 30 minutes. Cost per page Like was $0.004 – I was happy with what I got. I pulled out my ad report, then paused one of the ads that was not performing well and let the rest of them continue to run. To be honest, even if I didn’t do that, it was no biggie for me. The average cost per page Like was so cheap that even if one of the ads’ CTR was a little lower than those of the rest, I was still good. That is the beauty of running Facebook ads in low-competition countries. At that point I knew 6 ads were working for me. I created 6 more ad sets, using the same ads that have proven themselves good. I targeted these additional 6 ads at new countries. These were mostly developed countries with large English-speaking populations. For example: the UK, Australia, New Zealand, Germany, UAE, Brunei, Luxemburg, Hong Kong, Singapore, Switzerland, etc. People in these countries purchase products and services on the Internet just as much as Americans and Canadians do. These countries were definitely going to cost me more compared to the developing countries that were targeted in my earlier ad sets because there were more advertisers competing for their FB ad inventory. But the cost is still going to be way lower than what l would pay for the US and Canada inventories. I liked what I saw, so I kept the ads running. Some of my posts got shared by fans and I gained a 1088 more free page likes out of that. 10,121 page Likes in just 7 days! $52.06 / 10,211 page likes. That’s an average cost per page Like of $0.005. That’s about 30 times lower than the average cost per page Like that most marketers can by targeting US niche audiences. 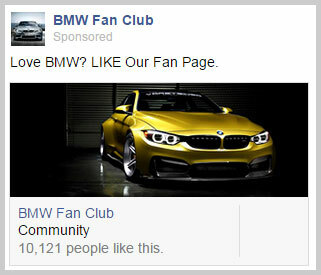 By then, I had a 10K fan base on my BMW fan page. It was time to regularly post content on the page to drive traffic to my site. The initial posts that I made on the fan page quickly saw some traffic building up on my website. The more content I posted on my fan page, the more traffic I was able to drive to my website. Once the traffic started to build up, I then monetized my website with products and services related to my niche. 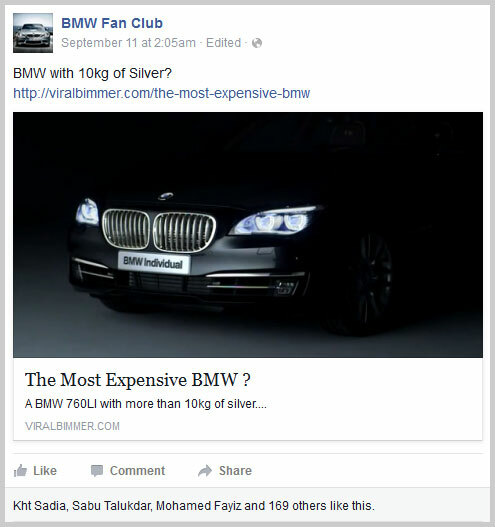 You’ve just read about my steps on driving traffic to my website using FB ads for cheap. Now it’s time for you to put these techniques into practice. Free PDF: Download my free PDF that shows you my complete list of countries with low Facebook advertising cost. The list contains all the countries that I use in my Facebook ads – and a couple of those that I didn’t include in my advertising experiment in this post. Got questions? If so, ask me here. Get FREE access to my list of countries with low Facebook advertising cost.